William Alexander Coulter was born on March 7, 1849 in Glenariff, Ireland where his father was captain in the Coast Guard. At age thirteen the younger Coulter went to sea and for seven years his apprenticeship allowed him to learn every detail of the ships on which he sailed. He had a natural gift for drawing and color and during his off-duty hours aboard ship he sketched and painted. After arriving in San Francisco in 1869, he worked as a sailmaker while continuing to paint in his leisure, and by 1874 was regularly exhibiting with the San Francisco Art Association. Coulter was for the most part self-taught except for a period of three years in the late 1870s when he studied in Europe with marine artists Vilhelm Melbey, Francois Musin, and Jacob Jacobsen. By 1890 he was living in Sausalito in a house that was just a few feet from the water. He kept a studio in San Francisco at 325 Montgomery Street, which he shared briefly with Hiram Bloomer. In 1896 he joined the staff of the San Francisco Call as their waterfront artist. His pen-and-ink drawings appeared daily in that newspaper until the disaster of 1906. One of his most important commissions was done between 1909-20 when he painted five 16' x 18' mural panels for the Assembly Room of the Merchants Exchange Building. This room was the center of all the trading and maritime business of the day on the West Coast. In 1923 the United States Post Office immortalized one of his paintings with a commemorative 20-cent stamp. He rarely departed from marine subjects and even his occasional landscapes contain a body of water. 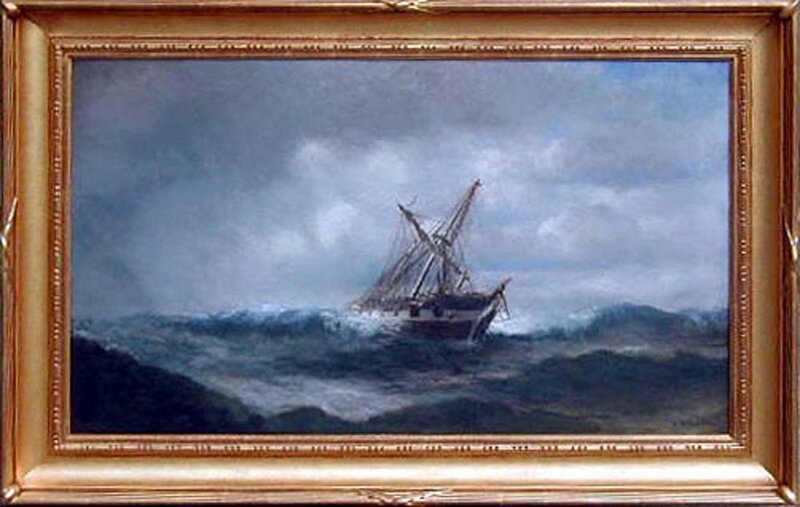 Unlike his friend Gideon Jacques Denny, he seldom painted ships in distress, but generally showed them in harmony with their surroundings or in their full glory. Captains and shipowners valued his ship portraits for their accuracy of detail. A prolific painter, from 1869 to 1936 he chronicled the shipping industry in San Francisco Bay, capturing the vitality of the square-riggers, hay scows, tug boats, and schooners that sailed in and out of the Golden Gate. Coulter died on March 13, 1936 at his Sausalito home having left a great legacy to California and the maritime industry. In 1943 a Liberty Ship was launched at the Kaiser Shipyard and named S. S. William A. Coulter.